We should “think freely about the huge variety of different forms of content that exist or could exist,” says von Berg. The future of publishing is the subject of an ongoing and intensifying debate. Even the term ‘publishing’ sparks discussion of how it should be defined. So let me start by explaining how I define “publishing” in context of this article. Icoon, for example, replaces text with icons intended to facilitate communication in a foreign country (“if you can’t say it, show it!” — yes, this is a book). However, a notebook, at least if empty, is not a book (yet). And I showed BELLA triste 30, a special edition of a literary magazine, for which writers had been asked to think and create something “beyond the book” — it looked like book but definitely was not a book. The product forms I used in my presentation should help us think freely about the huge variety of different forms of content that exist or could exist. While at the Forum I already knew that I would soon be spending two weeks in Istanbul where I would visit the Museum of Innocence, only recently opened by Orhan Pamuk. The building and opening of this museum was discussed by many papers, such as the Süddeutsche Zeitung, from which I will now quote. I had not read the novel, and I did not want to start reading it prior to going to the museum. I wanted to explore the idea that the writer of a classic novel and winner of the Nobel Prize can transform the concept of his novel into something understandable and comprehensible without using words. It was sure to be an interesting experience to find out later whether my impressions of and feelings about the exhibits could be reconciled with the world of the novel, or if the result would be differing impressions, which could perhaps only partially be brought into harmony. Each of the exhibits was attributed to one of the 83 chapters of the novel, but only using a few words or a very short text, so these descriptions could not be regarded as a real key to unlocking an understanding of why they had been chosen and what their function was. As a visitor to the museum, you were completely dependent on your sensitivity and empathy to approach the emotions generated by the exhibits. Your intellect or (any previous) knowledge were not required. Prior knowledge of the novel would only have helped to recognize some of the emotions described in the book. But clearly more than that was intended. My fresh impressions lead me to the conclusion that this description was wrong, as it did not capture the idea of the museum. But, sure, there was room for misunderstanding. One example: The exhibit I found most impressive was a window with a curtain. The window was open and you heard various sounds coming in from “outside”; you virtually felt “distances”. The curtain was gently blowing in the “wind” (created by a hidden fan). “Outside” it was “dark”. If this is about “love”, what does this “window” tell me? It tells me nothing if I want to know something, but it tells me many stories if I can feel something. The Frankfurter Allgemeine Zeitung published an article on the museum on 30 April 2012. The article concludes by saying, “the Museum of Innocence will also fascinate non-readers.” What should be added is that, if they are prepared to engage with it – that it is a different way of reading. The last quote from Orhan Pamuk in this article reads: “We want to exhibit emotions, not things.” What he does not say is, these emotions first had to be imagined by the author in order to represent them, but by totally different means; first in a book of about 1,000 pages, and second in a museum that exhibits things which reflect ‘love’ — an emotion which is both timeless and temporary — and which visitors must find their own individual way to relate to. Looking for an answer to the question of what innocence means in the name of the book and the museum, I started reading the novel, and today, as I am finishing this article because the editorial deadline is coming closer and closer, there are only 200 pages left. Many parts of the novel are, in fact, about guilt—a great deal of guilt created by many people and parties, often for cultural reasons, which only very slowly becomes smaller because of the efforts made by the protagonists towards each other. In the museum, however, there is nothing which indicates guilt. In an article celebrating the Nobel Prize winner’s 60th birthday, the Frankfurter Allgemeine Zeitung quotes Orhan Pamuk as follows: “Reading a novel is visualizing the pictures which somebody else created with his words.” Applying this to the museum, the quote should probably read, perceiving exhibits is visualizing the pictures which somebody else created by arranging these exhibits. In one case, the container is a book, and in another it is a building. What both have in common is the ability to communicate emotions. For me, the book couldn’t keep up with the building. Note: This is the translation of a German article written for the magazine “Dienstleistungen für Verlage und Buchhandel 2012” (Services for Publishers and Booksellers 2012), which, although not distributed until October during the Frankfurt Book Fair, had to be finished in July. 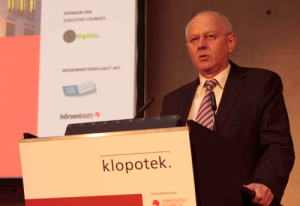 Helmut von Berg has been a Director at Klopotek & Partner GmbH since 2004. He has hosted the “Forum Herstellung im Verlag” (“Production in Publishing”) conference series since 2005 and initiated the “Publishers’ Forum” in 2009. During his many years managing production and publishing processes, he has held positions such as head of production, material scheduling and purchasing at Droemer Weltbild in Munich and head of production at Droemer Knaur and Walter de Gruyter. He is active as a consultant for business process analysis and is co-coordinator of the Frankfurt Book Fair’s Forum Production in Publishing (“Forum Verlagsherstellung”).